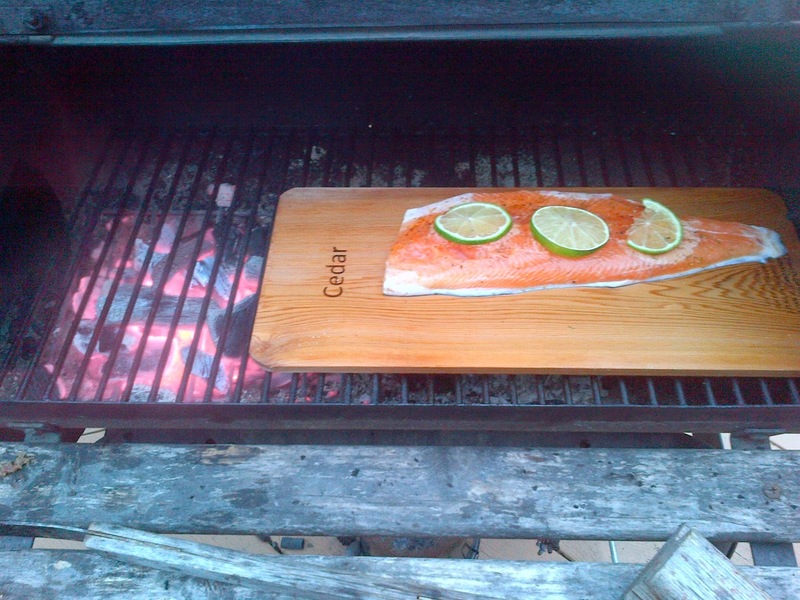 A few years ago, cooking salmon on a cedar plank kind of came out of nowhere to become all the rage in BBQing. Now, this is quite different than the other kind of planking. This was some time before I ever did more than grill burgers on a BBQ, so I never even bothered nor had much of a chance to try it out. I did a quick look-see on the Internet as I started writing this post and it turns out that the cedar plank technique is generally ascribed to the First Nations of the Pacific Northwest, which is cool since I'm always looking for more information on cuisines that aren't always prominent, and Aboriginal cooking is near the top of that list for me. So, when I came across a pack of planks in the BBQ section of the local Canadian Tire, I thought I'd give the technique a try, especially since it's an excuse to cook fish, which I don't get to do as often as I'd like. And while it doesn't seem to have that "trendy" quality anymore, I might as well give it a shot! Anyhoo, the basics of cooking on a plank is to soak the heck out of the plank and place it over hot coals (but not too hot, more on this later) with the meat on top and smoke the fish through the plank. 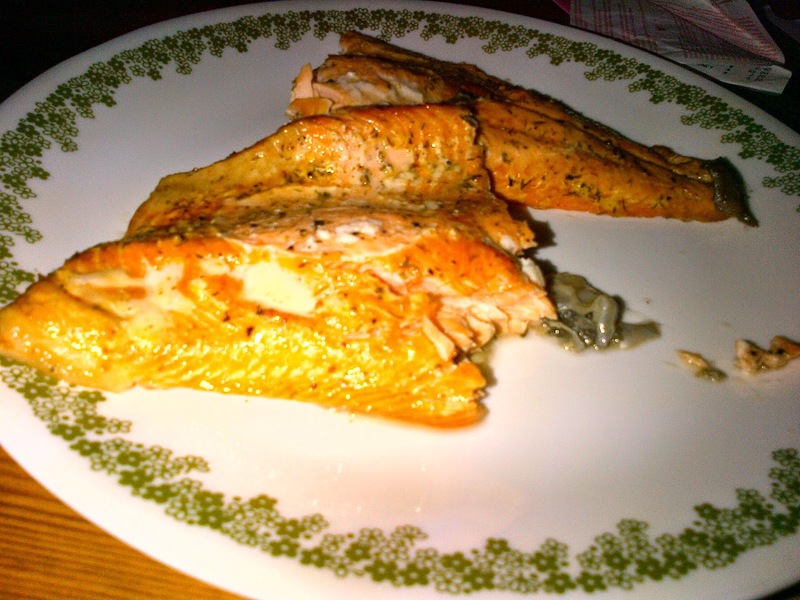 Now, I'm not sure if you've heard this from me before, but I have a soft spot for Arctic Char. It's a little bit like a midway point between trout and salmon. It's usually a farmed fish, but sustainably so, as opposed to Atlantic salmon and many species of BC salmon. It's generally cheaper than wild salmon which makes it an ideal choice in today's really freakin' expensive seafood market. So, instead of planking salmon, I planked char. Sue me...? So, here's how to make the deal! fire + wood + fish = Huzzah! - Soak cedar plank in water for at least 2 hours. - Using a pair of tweezers, remove any pin bones from the fish (if required). 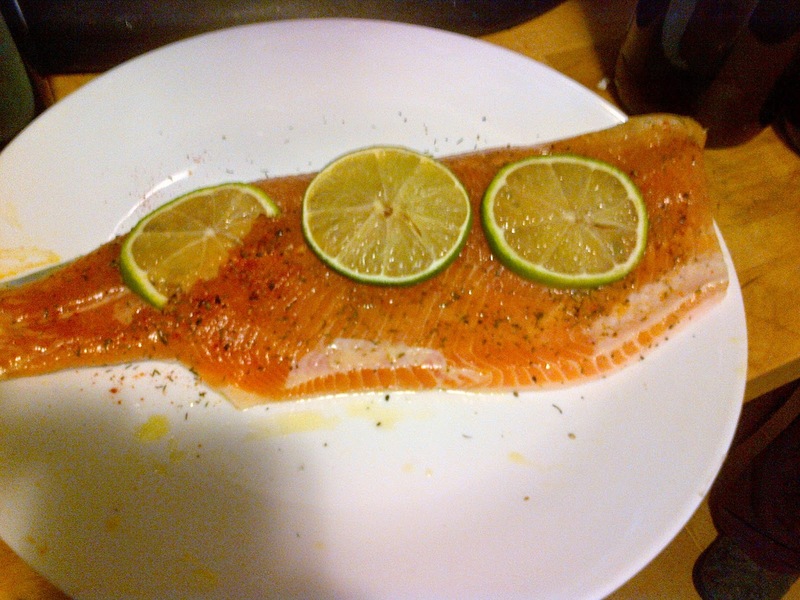 - Rub oil over fish and season with salt, pepper, paprika and dill. Top with lime or lemon slices. - Light fire and get temperature up to about 300-350 degrees. - Place fish on plank and put on BBQ. - Remove fish from plank with a thin spatula. If your Dex is high enough, you might be able to remove the skin without damaging the meat. Me, I like the skin, so I try to keep the whole thing together. Serve with whatever you feel like, but a wedge of lemon or lime is probably a must. 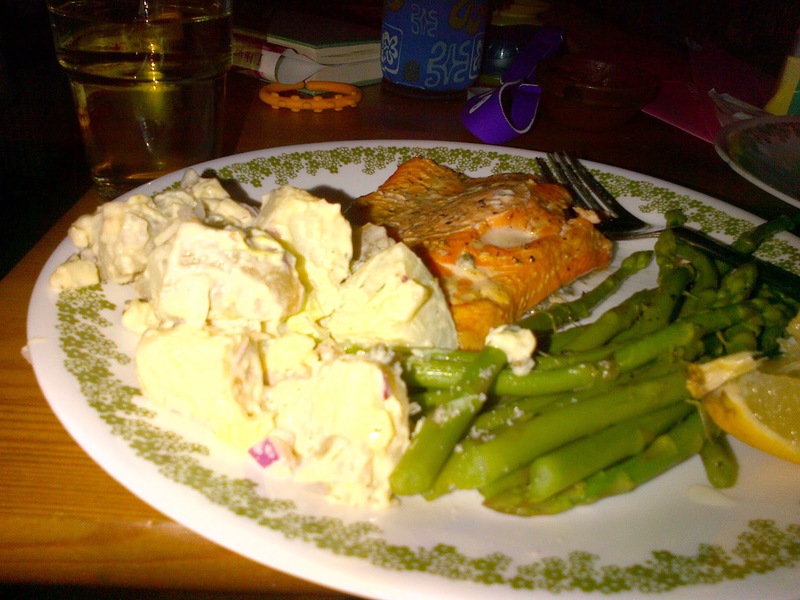 To accompany our dinner, we went with steamed asparagus and potato salad. I imagine it would also go well with fresh green beans, a good crusty bread or even a light pasta side. And now for the important part: Did it live up to the hype? Does it taste as good as one might imagine? Thankfully, yes. The fish was moist and juicy and beautifully smoke-flavoured without being overpowering, which was my main fear since cedar has such a strong aroma. So, I'll chalk this one up as a discovery! Now, with five or six planks remaining, the question is when do I do this next, and what sort of fish will I use?